It may well be that director Miguel Artete and screenwriter Mike White have initiated a new franchise for a string of movies unlike those regarding our friend Harry Potter and more akin to our president … Donald Trump. 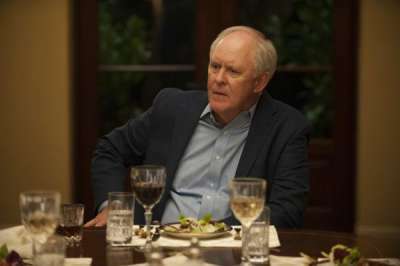 Subsequent films of such a genre wouldn’t have a sequentially connected narrative, but yet would always be a movie merely depicting the awful attitude of some wealthy, narcissistic white guy who’s infamous for being more than easy with routine prevarication and stiffing most of the folks with whom he does business. 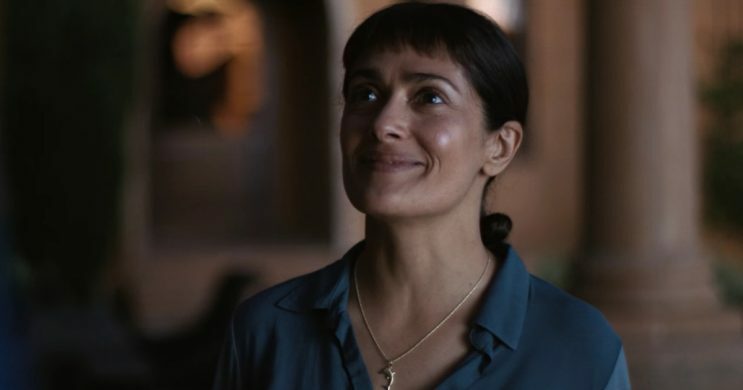 Beatriz … beautifully and skillfully played by Hayek … is a legally immigrated Mexican to So-Cal. She’s at the table only by chance. She’s come to give Cathy (Connie Britton), the hostess of the dinner, a late afternoon massage prior to the meal. 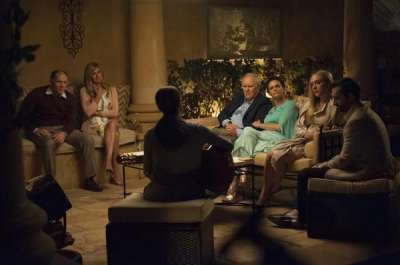 Beatriz’ VW has a dead battery, she finds, as she attempts to leave the Newport Beach mansion where Cathy resides with her husband Grant (David Warshofsky). Cathy invites Beatriz to stay for dinner as Beatriz, being a masseuse and healer of sorts, had formerly been of great aid to Cathy’s daughter when the girl was being treated for cancer. By the time the after-dinner-drinks are being imbibed, a tow truck will arrive in the wide circular driveway. But before it gets there, so much must be gotten through since other guests, receiving their invitations earlier, are also expected. There’s Doug’s wife Jeana (Amy Landecker) and Shannon (Chloë Sevigny) with her husband Alex (Jay Duplass). It’s a forced casual affair; the guys without ties, but still smartly attired and the gals looking rather snappy too. Doug and Jeana arrive in their chauffeur-driven SUV. All the guests are efficiently handled and served by Evan, Cathy and Grant’s sort-of-precious butler (sans jacket). John Early has that part. A comic title for this film might be My Dinner with Doug. (No, Louis Malle’s name isn’t in the credits.) But that’s inappropriate since Artete’s film really isn’t, to my mind, a comedy. 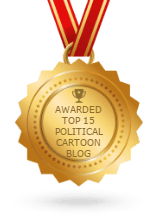 You will laugh lots (maybe more groans than chuckles) since Doug is a real SOB; but a clever, smart SOB. The others at the party with him could be considered more as his disciples or lackeys. Beatriz, a great lover of animals, is having none of that, however. Her kind, sensitive, thoughtful persona is ultimately erased due the boorishness of Mr. Doug’s big mouth and his big ideas as to how things “really” are in this world. A few glasses of white wine also push Beatriz to her stated edginess. The third act, surprisingly, becomes fraught with suspense. 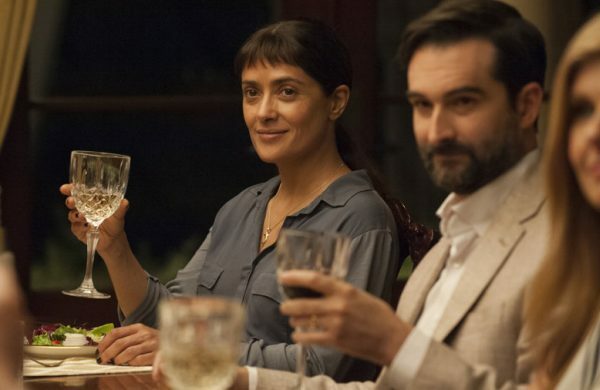 You’ll be asking yourself, “Oh God, what’s Beatriz gonna to do?” And you’ll ask that of yourself more than once, stemming from two totally separate places the script takes you — moving toward the movie’s completion. Without a spoiler, I’m personally glad what the creators chose to finish with. A higher road was their choice, but gladness is not so much what is wrought.